"We travelled as assisted migrants (Ten Pound Poms). My father and mother, Charles Henry and Doreen Ferrand, myself (15 yo) my younger brother Gordon (13 yo) and my sister Valerie Ruth (5 yo). 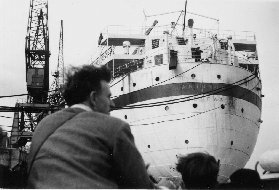 We left Southampton on the SS Asturias on the 5th November 1949 and arrived in Sydney on the 3rd Dec 1949 (from memory). 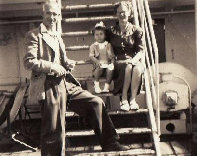 All the male passengers had separate sleeping quarters to the females, sleeping eight to a cabin, but we were allowed to be a family through the daytime and dined together in the dining rooms. The ship stopped at Malta and picked up 500 Maltese migrants who were quartered in the bow end of the ship. We also stopped at Aden, Port Said, Colombo, Adelaide and Melbourne before arriving in Sydney. We were sponsored by descendants of the family who sailed here in the days of sail, and whose family name at the time we arrived was Smith. They lived in Old South Head Rd, Vaucluse, a rather affluent suburb of Sydney. 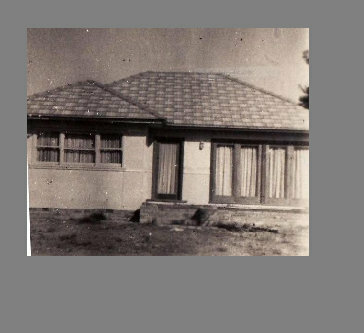 After about six months of living there in rather cramped circumstances (they were a family of four, two elderly sisters, one wheelchair bound, and two sons of one of them), and we family of five, my father, a carpenter, found a life-long friend from England who had bought a couple of blocks of land in Canley Vale in the western suburbs of Sydney and purchased one of them from him for ninety pounds. 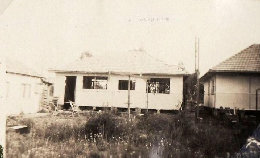 Canley Vale was a developing suburb and was still mainly scrub and dirt roads. We cleared the scrub and built a garage to live in (temporary dwelling) whilst we commenced to build our future home. Building materials were hard to find in those days and eventually after a couple of years or so we had completed a three bedroom home and happily moved into it. Both mum and dad passed away over the years and the three children are now all married with our own grown up children and grand children. By way of interest, I was told before we left, by a great aunt that a distant uncle in Belfast, Ireland had worked for Harland and Wolff, the company that installed the current engines in the SS Asturias. She also gave me a hand written copy of a diary written by Frank Ferrand and his sister Ellen who were the distant relatives that came to Australia in the sailing days 1883 on the Barque Ellenora." This summary was placed on the “Asturias” website by Frank Howett. If you would like to contact Frank, please send an email to the website administrator.